Things I liked: fits like a glove for my Beretta x/4 storm. What others should know: don't forget to order the black belt to go with it. Things I liked: Just got the holster. It might work on a child's leg but not on an adult. My legs are just normal. Not too fat or too thin. I adjusted the straps all the way out. The buckles pop with my slightest movements. I tried putting my 1911 in this thing. I could fit 3 of them in this holster and not fill it up. In fact my desert eagle is loose in it and wobbles all over. That's the largest pistol I own. I wouldn't recommend buying one of these. I had enough bullseye bucks to get this for free so I do not feel the need to return it. So I'll just chalk this up to a learning experience. Things I liked: The way the holster fits and secures my pistol, is outstanding. There's NO slippage and retrieving the pistol from the holster is so easy and safe. Things I would have changed: I would NOT change anything about the holster. What others should know: If you want safety, appearance and durability, this holster is what you're looking for! Things I would have changed: I'm 6'2" and 210 lbs. I work out virtually every day, and figure I'm in pretty good shape. For the life of me, I could not get it to fit on my leg, the straps are just too short, and a bit difficult to alter. Very frustrating. Things I liked: Well made, good fit, perfect for the Desert Eagle, great price...just fun! Things I would have changed: Nothing. A great buy. Things I liked: Quality materials. Good size to fit all types of pistols, fits my sig sauer p226 perfectly, a bit loose for my tanfaglio 1911 but still good. I would have rated 5 and 5 stars if the straps were long enough to go around my leg so I could use it. Things I would have changed: I would make the straps that go around the leg longer, I have mine maxed out and I still can't get it around my leg.... I'll be spending some cash on having them lengthened so I can actually use the holster. I'm 5 10 and 200lbs. It fits my daughter perfectly. I would have rated 5 and 5 stars if the straps were long enough so I could use it. Things I liked: It's what i wanted for my big pistols!! Very tactical, exellent for the beeman P1. What others should know: it's a perfect fit for the Beeman P1 pistol, plus you can carry ammo in the magazine pouch. Things I liked: It fits my gun great and secures my gun just as great. Just the look of it on you makes you feel cool, and professional. It's adjustable and has a nice black finish. It also has a nice secondary clip holder. Things I would have changed: i wish it would fit around your waist instead of your leg. What others should know: It takes a long time to adjust the lengths of the belt and two leg clips. 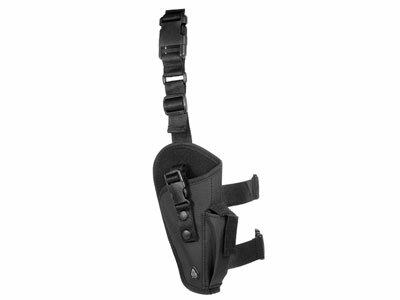 When on, it feels like the holster is relying to heavily on your belt. The two clips that go around your leg will twist a little, when you are running. But if you airsoft professionally it will be a good idea to purchase this. Things I liked: Very tactical holster!! What others should know: Yes, this holster can hold the Beeman P1 very nice!! Have not tryed other air pistols, but for the Beeman P1 is the best!! Things I liked: Good quality holster. Good for the money. What others should know: I like it. Things I liked: It's really the ideal holster and I love the ammo pouch. Things I would have changed: Make it be able to tighten more. I don't have extremely skinny legs but the holster still slides a bit on the tightest setting possible. What others should know: If dangling straps annoy you, don't get it. It's not too bad but if your really picky then don't get it because when it's tightened the straps do hang a bit. Things I liked: The holster is strong and does the job I ordered it for. Good fit and finish. Things I liked: I love it. My crosman 357w fits perfectly on this UTG Elite Tactical Leg Holster. What others should know: Buy it... and fast! Things I liked: Fit finish and price quick shipping WOW ! What others should know: Fit finish and price quick shipping WOW ! Things I liked: Price, very inexpensive. Was able to purchase a set (right & left) for my son's twin Walther P99's. Things I would have changed: Firearm retaining strap holds pistol very securely, but of poor design. Strap drops down inside of holster when pistol is removed. Takes two hands to re-holster, one to hold strap up & a second to re-insert pistol. I'll be cutting mine off & relocating it so it will drop down & hang outside of the holster. What others should know: A tad large for my son's Walther P99, but still works, pistol just sits a little low, but very secure. Open (bottom) end of holster large enough that Walther P99's silencer can slide through, so am able to leave silencer attached to weapon while in holster. At its highest position, still a tad long for my 8 year old (lower strap just above knee). Cut off lower strap (has 2 straps), all OK now. Mag pouch on front of holster holds P99 mag just fine. Pouch will also hold P99's silencer. You can't secure silencer with velcro tab (too short), but you really don't need to. Things I liked: Finally, a gun that can hold my Mk23 airsoft gun! The gun I own is more or less the same size as a DE .44 or .50. All the holsters I usually see and try are too small. I love this holster! I It fits well on my body. It feels secure but it has a healthy amount of movement. What others should know: My younger brothers have standard size airsoft guns (think Beretta 92's and other guns within that same size category) and they do not sit as tight in the holster as the Mk23. Nonetheless, they still fit well and secure. Things I liked: good size, does not fit small pistols as well as big pistols but i can secure my walther cp99 compact, also fits my sig sauer p226 perfectly. Things I would have changed: the mag pouch holds 2 walther cp99 compact mags perfectly but the full size sig mag doesn't fit very well. What others should know: I like the dual leg straps but i find they tend to slip, I probably would by the leg holster with the single rubberized strap if i were to buy another one, still great holster. Things I liked: It fits both my pistols perfectly, and they are both pretty big. Extra mag pouch fits a speed loader. Things I would have changed: It isn't big enough to fit an under barrel accessory like a laser or flashlight.